Planning corporate events and gatherings can be a real pain in the neck, even if you have the most resourceful and experienced event planner on staff. There are venues to book, caterers to test, speakers to contact, and lodging to book, need be. The last thing on the minds of corporate event planners is how to get every attendee from one place to the venue for the event. For companies that need a larger vehicle than the typical transportation services companies provide, corporate shuttle services in Miami should become a very important consideration. A minibus could very well be the perfect type of shuttle services Miami has to offer for your corporate event. In all reality, professional corporate shuttle transportation services is a cost effective way to move your attendees back and forth between venues. The expense of hiring numerous luxury cars to transport people versus the cost of hiring corporate shuttle services in Miami is a no brainer for most companies. Luxury Transportation Group USA offers the highest quality corporate shuttle services Miami has to offer. When a fair number of people need to attend the same event, more than likely there will be a few of them who wander in late. This is the norm anytime that an attendee’s transportation services are left up to each individual. Companies don’t want to hear that the car wouldn’t start, there was traffic or that a tire blew out on the way to the event. They want to see the attendees on time for the commencement, and stay throughout it until it is over. A reliable corporate transportation services company can ensure that your attendees get to the venue on time, and stay there for the duration. The professional minibus drivers at LTG Miami will have your attendees at the event on time every time. 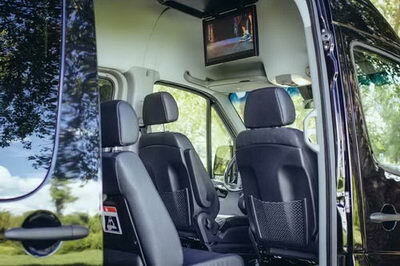 The seating in luxury minibuses is certainly a plus for those attending corporate events. Passengers each have their own cup holders that will prevent them from wearing their coffee, as opposed to drinking it so they are wide awake for the presentations. The seats are comfortable, probably more comfortable than the chairs at their desks in the office. Luxury Transportation Group USA offers luxurious and reliable minibus corporate shuttle services in Miami. Luxury Transportation Group USA is the premiere provider of all types of luxury transportation services in Miami. The fleet of vehicles is capable of taking only the company president to the event venue, or transporting a group of attendees with their corporate shuttle services. Call LTG Miami for all of your shuttle services Miami needs.